We are proud of each and every one of our launches. 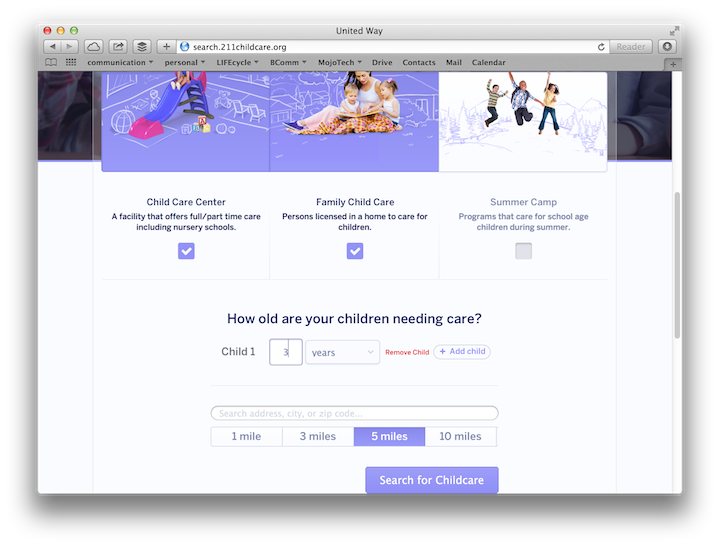 "The best childcare search engine in the country." This week, we launched a new product that makes us feel even more proud than usual. The quality of the product is in line with what we and our clients have come to expect, but this launch also gives us that nice warm-and-fuzzy feeling. 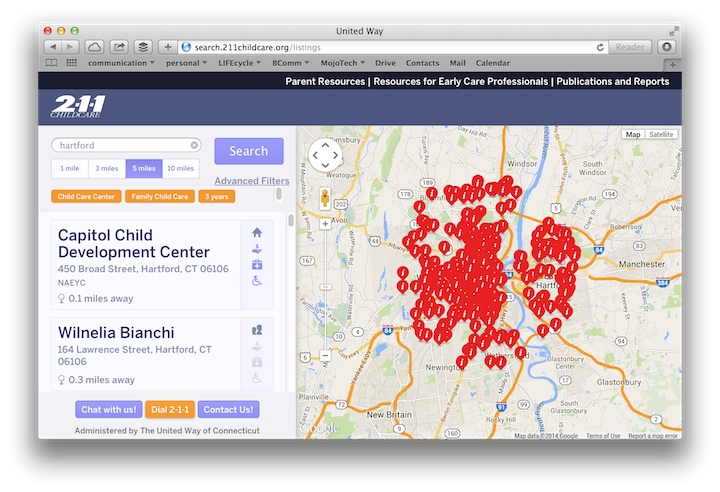 Last fall we partnered with United Way of Connecticut to overhaul their 2-1-1 childcare search engine. The free community referral service connects residents with information and services for state licensed child care centers and family child care homes. It also lists nanny agencies, nursery schools, play groups and summer camp programs. It started as a toll-free phone assistance line, but the need quickly grew and their system could no longer meet the demand. They needed a product that could deliver this important service effectively and efficiently, and it needed to be extremely user-friendly. It was crucial that the app was designed to meet the needs of the parents who would rely on it for their most pressing and important concern – easily finding a safe place for their kids. The site allows parents to search based on the criteria most important to them. Users are able to locate each provider on a map, learn about their experience and credentials, and ensure the provider can care for their children. Using the search engine is now simple and direct because it uses visual cues and patterns that are immediately recognizable to parents. It has a great UX – something pretty much unmatched in an industry traditionally filled with antiquated, cookie-cutter database sites. The product finally matches the level of service United Way of CT is providing to families in their communities. Parents in Connecticut can now easily access the information they need to keep their kids happy and safe. 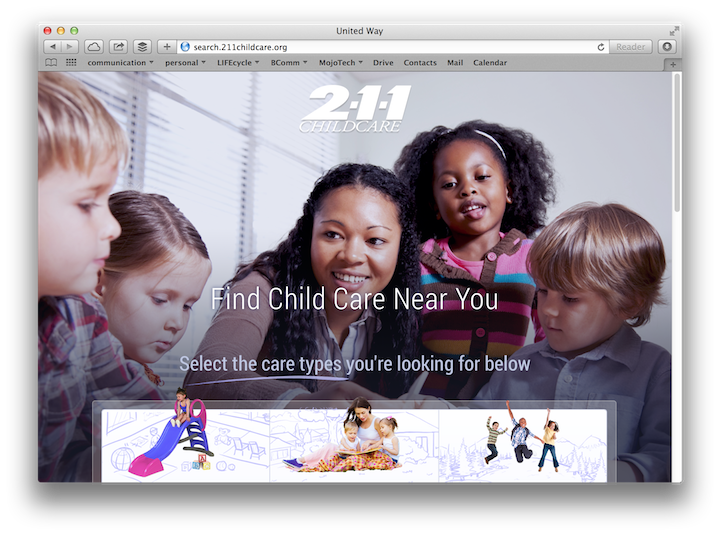 In fact, the CIO at United Way called it "the best childcare search engine in the country." As a Mojo, I'm darn proud of this launch. As a parent, I'm a little jealous of CT.